Our fourth post in a series counting down the 10 most influential books I’ve read this year – 2011. Every business needs a content marketing strategy. 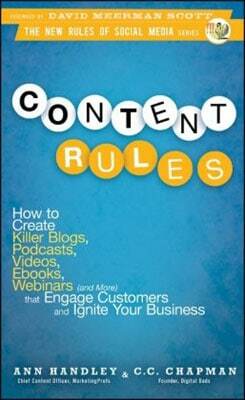 This is the best book I’ve read on content marketing. It includes tips, tricks and case studies. It enhanced the quality of the Ideas Marketing webinars so much we even did a Book Rapper version webinar on this book. Buy it if you’re use content to promote, educate and sell your business. Here’s the slideshow from our webinar on this book: Captivate Your Clients With Killer Content – Slideshow. Should I Do Social Media If My Clients Don’t?